I don't really know why, but somehow I feel it's more difficult to cope with a fatal race incident. It's sad of course to see such a young person die, but the way it looks like (although the autopsy is still to come) this probably could have happened any day, also in training, so for me personally I somehow see it pretty unrelated to the race itself. Now that it did happen in the biggest classic there is though, let's hope it will lead to some changes in regards of steady medical observation, heart disease screenings and so on at least. I am quite sure that most of the teams have regular heart checkups more frequently than required these days. Of course, I don't know about all of the smaller teams, but with the topic having come up before, some WT teams have responded in interviews and whatnot that they do more as part of their routine. I believe I recall that a few riders have even had heart surgery in recent years, to correct problems that would have gone under the radar with an old-fashioned stethoscope routine. Goolaerts, though, was on one of the smaller teams, and who knows how extensive their testing was. "Unrelated to the race itself . . ."
Yes, quite so. There has been no indication that this incident was caused by head or neck trauma that was a direct result of the accident. Oddly, perhaps, because it was apparently a more personal health incident, I find it easier to deal with, rather than harder. I can certainly empathize with you though. I have been told that Burghardt was part of Terpstra's G2. If that is correct, and if he managed to slow the chase, even a little, that could have made all the difference. At 20km to go, Sagan-Dillier had pulled the gap out to 1:30. Between 18km and 8km Terpstra et al managed to gain back half of that - cutting the gap to :44 at one point, when it once again stabilized. It was only then that one could forecast with confidence that Sagan-Dillier looked to make it all the way. If Burghardt WAS in Terpstra's G2, and managed to help control the gap, add Siskevicius, and I think the status of this race just went to 4.5 stars or better. Really great little story. Terpstra accelerates with Vanmarcke on his wheel (below the "45.6"), Gilbert closely behind. Van Avermaet in 4th gets out of the saddle to close the gap with a sprint, Bert de Backer on his wheel, somehow managing to keep up with him. Then we have Burghardt, Grondahl and Haussler. Haussler passes the young Jumbo rider on the right but gets blocked by Burghardt, leaving him with no chance to close the gap. 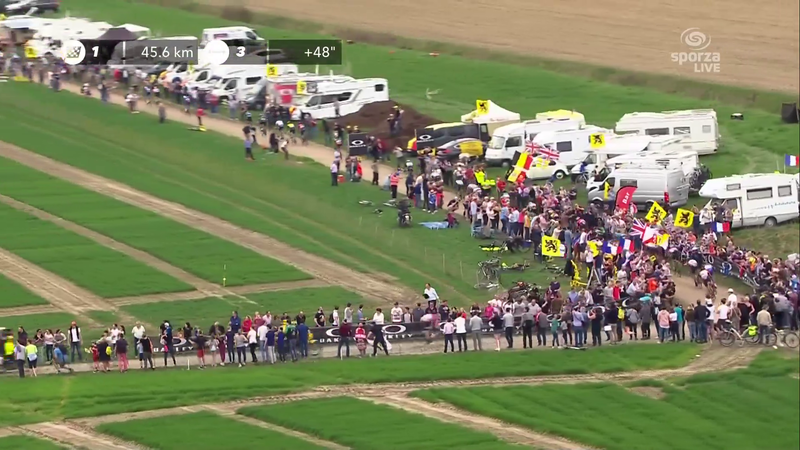 In the next shot (after showing EBH dangling at the back...) we see Terpstra, Vanmarcke, Gilbert, van Avermaet and de Backer together at the end of the sector. De Backer explodes immediately. Gilbert pays for his effort in the next sector. That's how G2 established. Haussler said he had another try and came close to get back into G2, but then he had a mechanical and his race was over. only until Mons-en-Pévèle. . . .
Ah, thank you. So Burghardt had 5 or 6 km to impact the chase. Not much, maybe something, maybe "every little bit helps". I think, given that nobody jumped to catch Sagan, Burghardt played his part well. On the front at the right time. I heard elsewhere that Burghardt was on the front at the time Sagan jumped, meaning anyone wanting to chase would have to go around. One of the big boys said he was a bit back and blocked, and wondering why nobody was chasing Petr as he watched him go up the road. I forget which one. But it looks like Burghardt played the part to perfection for long enough, and Sagan timed it to perfection. I'm downloading recordings now to go back and take a look. If you haven't seen this, you must do so! SO perfect! Terpstra checks Peter's tire pressure! Feels strange to discuss racing after all that has happened. Utterly tragic, can only hope that there is some positive to come out of this, improved heart screening or something, greater awareness of undetected cardio issues etc. Just heartbreaking. As for the race itself, to me the most interesting aspect was the cooperation between Sagan and Dillier. I know it's not exactly popular, but I can't help wondering if Peter's whining is paying off. In AG's thread last week, I suggested one of Sagan's weaknesses was his ability to strike a bargain. He seems very much to have done so with Dillier; I wonder if a rider like Dillier would have worked with 2015 Sagan, or seen the headstrong youngster's trust in his sprint as a golden ticket to the velodrome. I suspect the latter. I wonder too if it contributed to the initial intertia when he went clear - nobody really fancied 50km of him yapping about a lack of cooperation so just left him to ride away. It is interesting that for all his talent in a sprint, his monument wins have both come by going solo. "Sprint" always was a bit of a poor word to describe what happens in a finish of 7 hour long race. Road racing is primarily an endurance sport, and the best classics riders may be unmatched (on this planet) when it comes to stamina. This stamina is their primary qualification, and if they can finish fast after enduring 7 hrs in the saddle, great! Then they're all of a sudden referred to as sprinters. To add even more of a word-wise paradox, the longest race on the calendar is often referred to as the sprinter's monument. Anyway...my point is ... when a "sprinter" wins a monument on a longer range attack, it's an endurance athlete using his or hers primary qualification: stamina, endurance, and winning from that rather than the secondary skill of finishing fast. If they don't have the endurance they will not be there when the sprint starts and it does not matter how fast they are over the final 300 m.
Completely agree, and not meaning to take away from Sagan's obvious stamina and resistance. I was more making the point that Sagan seems not to go clear of the favourites group with other riders very often - it's either clear alone or stalking the group waiting for the "sprint". Even with Dillier it seems to me that he benefitted from having a rider with him who both knew would be happy with 2nd, not a genuine pre-race favourite. If anything I suppose what I'm saying is that Sagan can trust in his sprint too much and never quite feel the need to make the race himself, but has actually found a lot of success when he does so. In that sense I would distinguish Kristoff-Terpstra, in that the pair of them were both favourites, and went clear together. I don't know if Sagan's troubles are more related to him or to others, to his inability to marshall a group or the group's unwillingness to work with a rider who can outsprint anyone but the top flat-track boys a la Kittel etc.
. . . Sagan seems not to go clear of the favourites group with other riders very often - it's either clear alone or stalking the group waiting for the "sprint". Even with Dillier it seems to me that he benefitted from having a rider with him who both knew would be happy with 2nd, not a genuine pre-race favourite. If anything I suppose what I'm saying is that Sagan can trust in his sprint too much and never quite feel the need to make the race himself, but has actually found a lot of success when he does so.
. . . I don't know if Sagan's troubles are more related to him or to others, to his inability to marshall a group or the group's unwillingness to work with a rider who can outsprint anyone but the top flat-track boys a la Kittel etc. Except he even outsprints them often enough they are wary of him. I'd say you've hit the nail on the head - the source of discontent. It could be just a bad case of gas, but I have a feeling this win turns a personal corner for him, what with complaint-gate being in the air and all. I have a feeling we will see Sagan's tactics and attitudes shift a little in the future. I don't think it will take a whole lot of shift - remember who was pulling when the jacket flapped last year. He's been out there, but just not as much as might be. And, unlike some riders (I'm thinking Bouhanni), Peter actually seems to care whether people like him or not, and the peloton, by and large, do like him.
. . . Burghardt . . . Sagan timed it to perfection. I had a brief moment to review. When Sagan went, it was more like he just rolled off the front. Somebody from BMC was actually on the front as Sagan went. Burghardt was a few slots back - maybe 3, maybe 5, I didn't look close enough. But BMC just let him roll! Musta been tired. I think the defining factor for this race was that it was Quickstep vs everybody else. At the point at which Sagan eased off the front, the only match Quickstep had to burn was Terpstra himself. And even during the chase, the fact that unless Terpstra was on the front, the chasers were going no faster than Dillier suggests that there was no desire to chase down Sagan and let Terpstra in. QST tried to boss the race as they did so successfully this Spring but this time got caught with too many chiefs and not enough indians.